알렉산드르 알렉산드로비치 알레힌(러시아어: Алекса́ндр Алекса́ндрович Але́хин, 영어: Alexander Alekhine, 1892년 10월 31일 ~ 1946년 3월 24일)은 제 4대 세계 체스 챔피언이다. Alekhine, Alexander (1968). 《The Book of the Hastings International Masters' Chess Tournament 1922》. Dover. ISBN 0-486-21960-7. 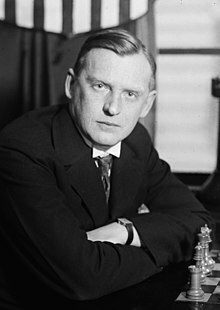 Alekhine, Alexander (1961). 《The Book of the New York International Chess Tournament 1924》. Dover. ISBN 0-486-20752-8. Alekhine, Alexander (1962). 《The Book of the Nottingham International Chess Tournament》. Dover. ISBN 0-486-20189-9. Alekhine, Alexander (1973). 《The World's Chess Championship, 1937》. Dover. ISBN 0-486-20455-3. Alekhine, Alexander & Edward Winter (1992). 《107 Great Chess Battles 1939-1945》. Dover. ISBN 0-486-27104-8. ↑ Wall, W. “Alekhine's Writings”. 2009년 10월 25일에 원본 문서에서 보존된 문서. 2008년 5월 20일에 확인함.